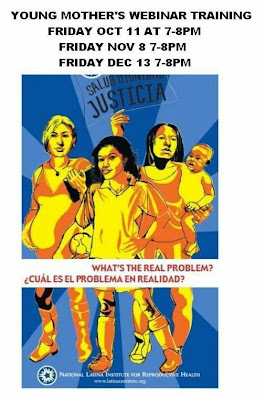 About a year ago I was approached by The National Latinas about their new young mothers advocacy program. I can honestly say that NLIRH is one of the biggest reasons I am the advocate I am today! Don't miss this chance to learn, network, and meet some amazing people! Sign up today! The National Latina Institute for Reproductive Health believes in the importance of supporting young women's decisions over their bodies, which is why we've created this webinar training. This Electronic - Latinas Organizing for Leadership and Advocacy (E-Lola) Training is designed for young mothers (under 25) who wish to make a difference in their community or become more aware. The E-Lola is made up of 3 sessions each is an hour long. To attend an E-Lola, one must have access to a telephone and computer with internet connection.